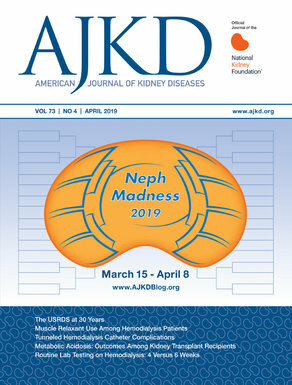 Fig 1 Fakhouri et al AJKD, ©National Kidney Foundation. Atypical hemolytic uremic syndrome (aHUS) is a severe form of thrombotic microangiopathy that frequently causes acute kidney injury (AKI) and leads to chronic kidney disease (CKD) and end-stage renal disease (ESRD). Unlike patients with “typical” HUS that can be associated with Shiga toxin, ADAMTS-13 deficiency, medications, and cancer, patients with aHUS generally do not respond favorably to plasma exchange. Recent studies attributing the pathogenesis of aHUS to inherited or acquired defects in the alternative complement pathway paved the way for the development of eculizumab (Soliris, Alexion Pharmaceuticals), a monoclonal antibody directed against the C5 complement component, as a novel therapy for aHUS. Earlier this year, the results of two phase 2 trials studying the use of eculizumab in 37 patients with aHUS were published in the New England Journal of Medicine demonstrating both a positive hematologic and renal response with extended treatment with eculizumab. Eculizumab is dosed at 900 mg IV weekly for four weeks, followed by 1200 mg IV every two weeks. Optimal treatment duration has not been well established, though it appears that many patients require prolonged treatment. Patients must receive a meningococcal vaccine 14 days prior to initiation of treatment, or receive prophylactic antibiotics for 2 weeks after the vaccine is given. In a recent article published by AJKD, Fakhouri and colleagues report their findings from a retrospective study of 19 adult patients with aHUS who were treated off-trial with eculizumab. The authors state that this is the largest reported series of aHUS patients with native kidney involvement receiving eculizumab; the trial published in the NEJM enrolled patients with aHUS involving both native and transplanted kidneys. aHUS was defined as having 3 or more of the following: 1) AKI (serum creatinine > 1.4 mg/dL), 2) mechanical hemolytic anemia (hemoglobin < 11 g/dL, LDH > upper limit of normal, undetectable haptoglobin, and presence of schistocytes on peripheral smear), 3) thrombocytopenia (platelets < 150 x 103/mL), and 4) a kidney biopsy with characteristic features of TMA (microvascular platelet and/or fibrin thrombi, glomerular endothelial cell detachment, and double contours). Patients who had received at least 4 weekly infusions of eculizumab were included in the analysis. Assessed outcomes included kidney function, hemolysis, and thrombocytopenia, and comparisons were made with 41 historical control patients taken from a French aHUS registry who were diagnosed with aHUS between 2004-2008 but not treated with eculizumab. One distinguishing feature of this article is that the authors present a comprehensive complement analysis of the patient population in Supplemental Table S2. A low C3 level was present in only 5 of 19 patients, reaffirming the findings of previous studies which have also shown that a low C3 is not the rule in aHUS. Thirteen of the 19 patients had a documented complement gene mutation, the most common of which was a mutation in complement Factor H. One patient had an anti-Factor H antibody. A number of other patient characteristics in this study are worth mentioning. Interestingly, four patients did not have thrombocytopenia at the time of initiation of eculizumab. Ten out of 19 patients (52.6%) presented with a triggering factor. Diarrhea was the most common trigger, present in 50% of the patients with a trigger, which is consistent with previous reports documenting a preceding gastrointestinal illness in up to 25% of cases of pediatric and adult aHUS. Postpartum period, pregnancy, and sore throat were the other preceding triggers. This highlights the important and perhaps often overlooked fact that the majority of cases of aHUS have a triggering factor, and that a presumptive diagnosis of typical HUS should not be made in a patient on the basis of a recent history of gastrointestinal illness. Such a misdiagnosis could lead to a delay in making the correct diagnosis, which could have a significant impact on patient outcome. Treatment with eculizumab resulted in an improvement in kidney function in most patients with aHUS. All patients had AKI. Twelve of the 19 patients were on hemodialysis prior to the use of eculizumab, and the median serum creatinine in non-dialyzed patients was 2.84 mg/dL (range 1.64-7.41). At the end of the follow-up period, 10 patients had recovered normal kidney function, 6 had residual CKD but did not require dialysis, and 3 patients remained dialysis-dependent. Compared to the historical controls, who were similar with respect to age, gender, requirement for dialysis, and frequency of complement gene mutations, the risk of ESRD at 3 months from the onset of aHUS and at 1 year of follow-up was reduced by 63% and 60%, respectively. Of the 3 patients that remained dialysis-dependent, one was considered “eculizumab resistant” after only 3 weeks of eculizumab therapy, raising the question of whether this patient’s treatment was stopped prematurely. There are currently no set guidelines on the duration of eculizumab therapy for aHUS, but the authors argue that since some patients treated with eculizumab for aHUS have recovered kidney function after months of treatment, a course of 3-6 months should be tried before a diagnosis of eculizumab resistance is made. Furthermore, the authors make a point of trying to correct the misconception that parameters such as LDH and platelet count should be used as indicators of successful treatment with plasma exchange. As an example, they cite a patient in this study whose platelet count normalized after 5 sessions of plasma exchange, without any improvement in kidney function. Unfortunately, this delayed the initiation of eculizumab in this patient by 4 weeks, and in spite of five months of eculizumab therapy, the patient was one of the three patients that remained dialysis dependent. Another observation is that there were no differences in serum creatinine levels between patients who rapidly normalized their platelet counts in response to eculizumab compared to those who had persistent thrombocytopenia at the same time point (day 7 after the start of eculizumab). Given this discrepancy between the hematologic and renal response to treatment, the authors state in their discussion that perhaps the more meaningful goal of treatment in aHUS is an improvement in kidney function, rather than only monitoring for normalization of LDH and platelet counts. Although this study is retrospective in nature, it provides us with important and informative data about the treatment of patients with aHUS with eculizumab. As nephrologists, we will undoubtedly be called upon to assist with the management of patients with aHUS, and it is increasingly more important for us to recognize the presenting features of the disease and to be comfortable with treating these patients. Hopefully, we will continue to benefit from greater patient experience from multiple centers in order to gain a more complete understanding of how the use of eculizumab in aHUS can be optimized.